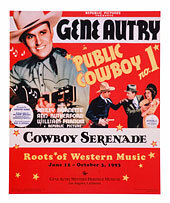 GeneAutry.com: Music, Movies & More - Poster "Cowboy Serenade: Roots of Western Music"
Poster "Cowboy Serenade: Roots of Western Music"
This poster is sure to become a collectable! Originally created in 1993 for the special museum exhibition Cowboy Serenade: Roots of Western Music, this poster features the Autry National Center's original name and logo. Lobby card art for Gene Autry's Republic Pictures Public Cowboy No. 1 forms the basis of this colorful poster.